Crosstalk is a unique file and contact information sharing program over WiFi for the HP webOS platform. •	Setting up “my profile” information. •	Selecting which photos and which contacts I want to share. •	Searching for friends near me. •	Selecting the friend I would like to share the information with. 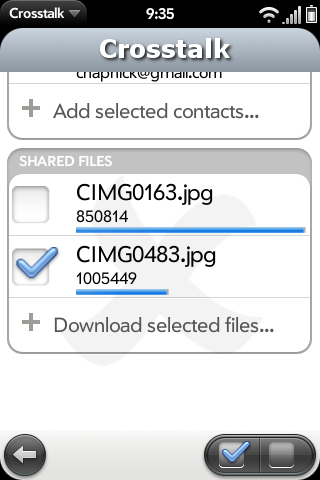 •	Sharing the files and contacts with the friend. who needs bump when you can crosstalk share? this app requires webOS 2.x and will not work on the 1.4.5 and below. at the moment only pre2 users can enjoy it. keep in mind, this is the first public beta - I'll be happy to hear your thoughts, ideas and comments.